Microsoft Teams is a cloud-hosted system and while its use is optional , all usage must comply with Western's Computing, Technology & Information Resources Policy and Data Classification Standards. 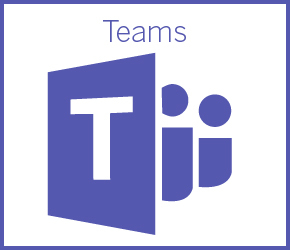 Microsoft Teams is a group collaboration app available to faculty, staff and students through Western's Office 365 Microsoft Campus Agreement. It helps you collaborate using chat instead of email, channels instead of just file folders. It's a workspace where you and your Team can securely share, edit, save files, calendar, see likes, @mentions, and replies. Any documents, spreadsheets, presentations that are shared within a Team are stored in your Team environment so every Team member always has access to the latest version. Microsoft Teams is available by opening a browser and signing into Western's Office 365 and choosing Teams. *Note the Teams website does not work in the Safari browser. Mac users will need to use another browser such as Chrome or Firefox. There is also a desktop app for Teams available for download, for mobile see your particular app store. * WTS support for Microsoft Teams is on a best effort basis. ** All your data when using Microsoft Teams resides in Canada except for data in the chat function.